Why do people love Verdure? "I usually break out to most products. Verdure has been great for my sensitive skin." Gia N., Stanton, Calif.
Dr. Elizabeth Tanzi mentioned Verdure Rejuvanating Masque Peel as a top mask for acne and aging skin in People Style Watch. Pasadena Magazine lists Verdure Botanoceuticals as an Enviro-Star, giving us a green stamp of approval in its April 2009 issue. 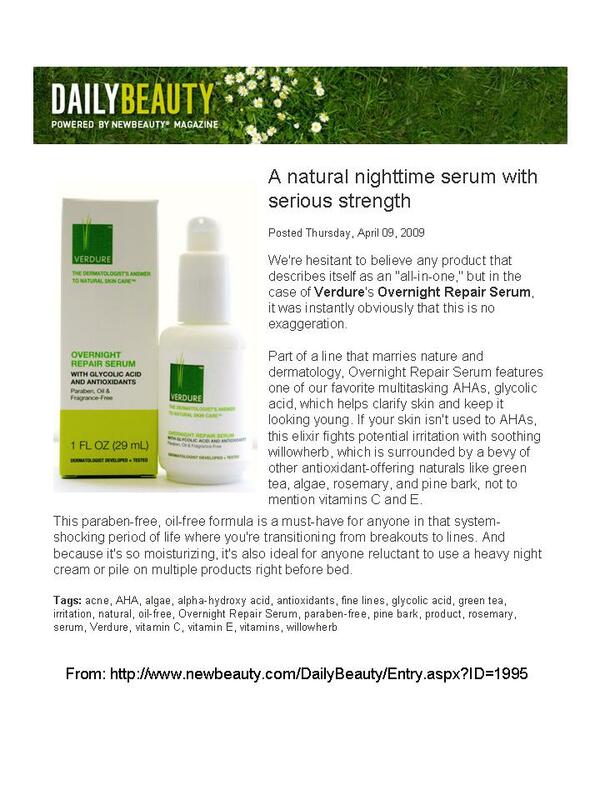 New Beauty magazine praises Verdure Overnight Repair Serum in its DailyBeauty blog in April 2009 as a "must-have". Verdure Botanoceuticals is on Facebook! Look for us and add us as your friend! 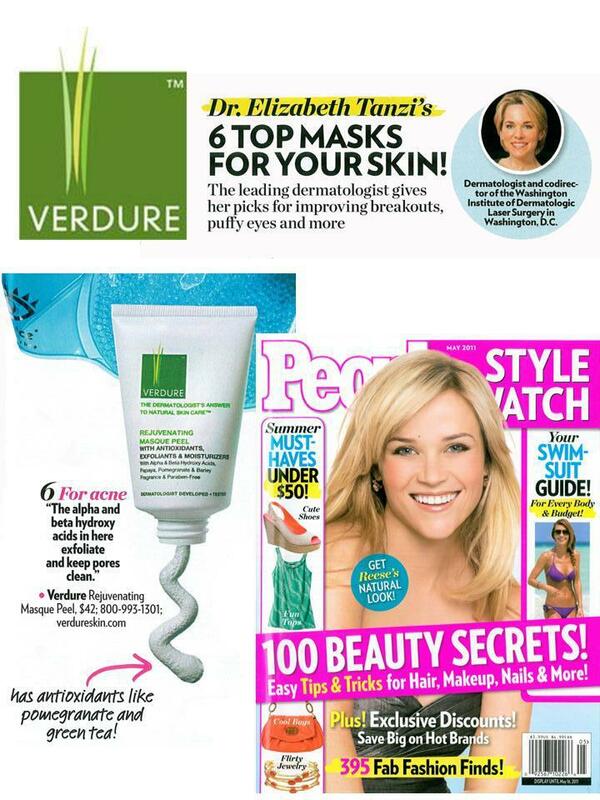 Audrey magazine featured Verdure Botanoceuticals in Audrey Beauty Kit in the December 2008/January 2009 issue. Splendora.com features Verdure Botanoceuticals in their weekly "What to Beauty" blog. Lucky magazine featured Verdure Matte Moisturizing Physical Sunscreen with Antioxidants SPF 28 as one of the best new physical sunscreens in the June 2008 issue. 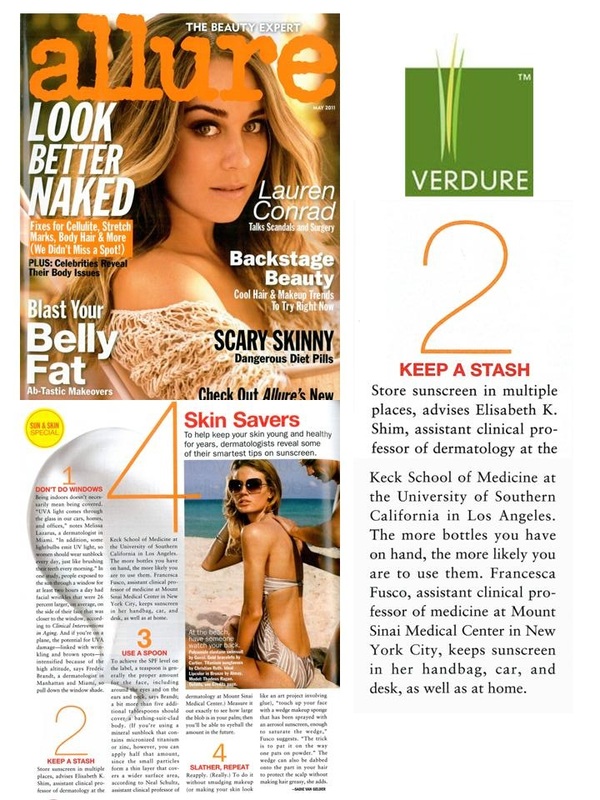 Allure magazine featured Verdure Matte Moisturizing Physical Sunscreen with Antioxidants SPF28 as one of the most promising new sunscreens in the May 2008 issue "Calm, Cool and Corrected" pg. 146. Other Verdure products will be discussed in a future issue of Allure on food and skin. KoreAm magazine featured the story behind Verdure's creation in it's 18th Anniversary issue, April, 2008 "Back to Nature"
Researchers at Johns Hopkins University discovered that broccoli extract helps fight skin cancer not only in the lab, but also when applied to human skin! Italian researchers have shown evidence that chemical actives and preservatives in sunscreens damages coral reefs. The suspected ingredients include parabens and benzophenones (such as avobenzone, a common chemical sunscreen active). We are happy to tell you that Verdure Matte Moisturizing Physical Sunscreen lacks these ingredients and is very water-resistant, which would reduce the amount of sunscreen released in the water.